Earlier this month I made myself a rough plan of how I would like to tackle the multiple hand piecing projects I have on the go. I decided the easiest way would be to roughly divide them into blocks of time during the month. I’m not going to be rigid about this, but more or less use it as a guideline. I have two Willyne Hammerstein projects going. I’ll work on those from about the 1st of the month to the 15th. I’ve already shown pictures of my progress with those in earlier posts this month. Then from the 15th to the 21st I’ll play with my Connections pieces. I didn’t get much of that done this month, but did make a little progress. 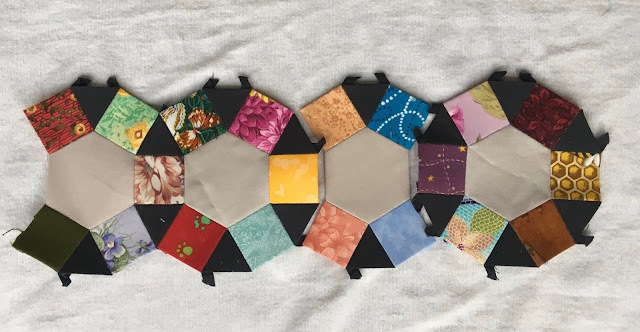 And then from the 21st to the end of the month I’ll play with the sampler I started a couple of years ago using half hexagons paired with other shapes. In between working on these I’ve also been doing a lot of knitting. The online store EatSleepKnit does a yarnathon thing where you can participate in knit alongs and for some reason it caught at my attention at the beginning of this year. The first challenge was to knit something using a pattern from an Australian designer named Ambah O’Brian. I think one of the things that caught my attention with this was the challenge to try some new stitches and techniques and new knitting designers. I’ve finished the first quarter challenge already. 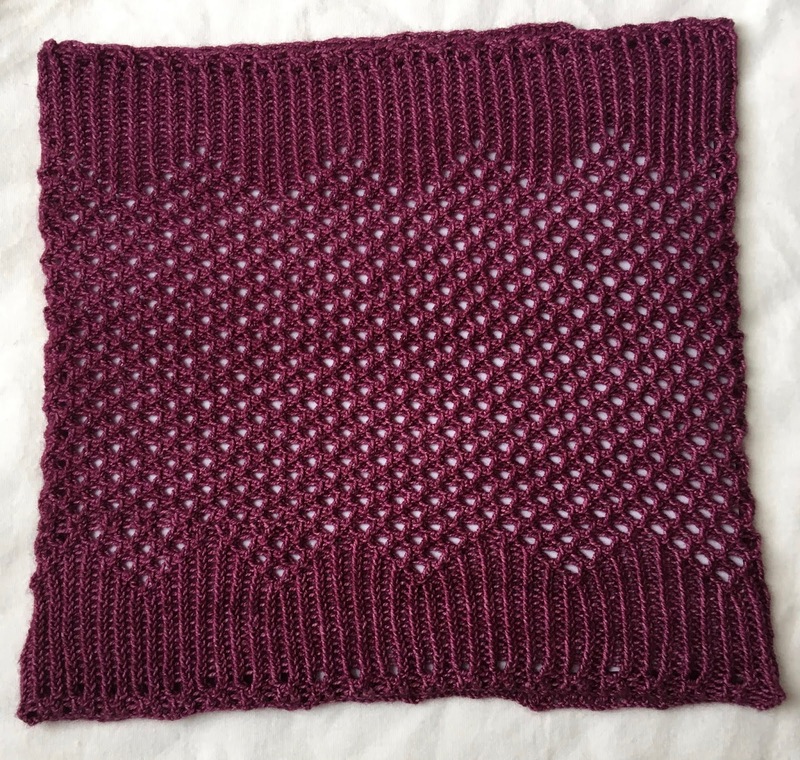 I did up a pattern called the Mendia Cowl. Mine looks like this finished. I slipped a couple of pages of white paper into the cowl so that the lace work on it would show up in the photo. There were a number of different techniques in this I’d never done before so it was a challenging and fun knit. It did have the down side that the eyelet pattern that is on the other side of the cowl isn’t completely lined up properly. But I wan’t going to rip it out and it won’t be noticeable when it is being worn and it will still be warm even with the mistakes. Now I’m working on a very large shawl using up some Alpaca yarn that I bought quite a few years ago. I made a pair of socks out of it, only to find that they shrank quite badly when accidentally thrown into the washing machine. So the yarn sat and aged while I waited to decide what to do with it. The pattern is called Impressionist MKAL. The designer used three colours, but I’m only using two. Right now the pattern says that it is 75% done and there are 462 stitches on the needles. You can see a bit of the lace work in it and also the colours of the yarn. I’m two rows away from changing back over to the gold yarn for the final edging rows. Only 24 more rows to go and it is finished. But considering that the final number of stitches is 534, it is going to take a while to get it done. Given that it is a very cold day out there, my goal for the day is to stay inside where it is warm and play with fabric and yarn. So I’m going to link up to Kathy’s Slow Sunday Stitching and then finish up my coffee and then stitch slowly and relaxingly for the rest of the day. So far this year I’m even. I’ve finished 2 hand stitching projects and started two new ones. 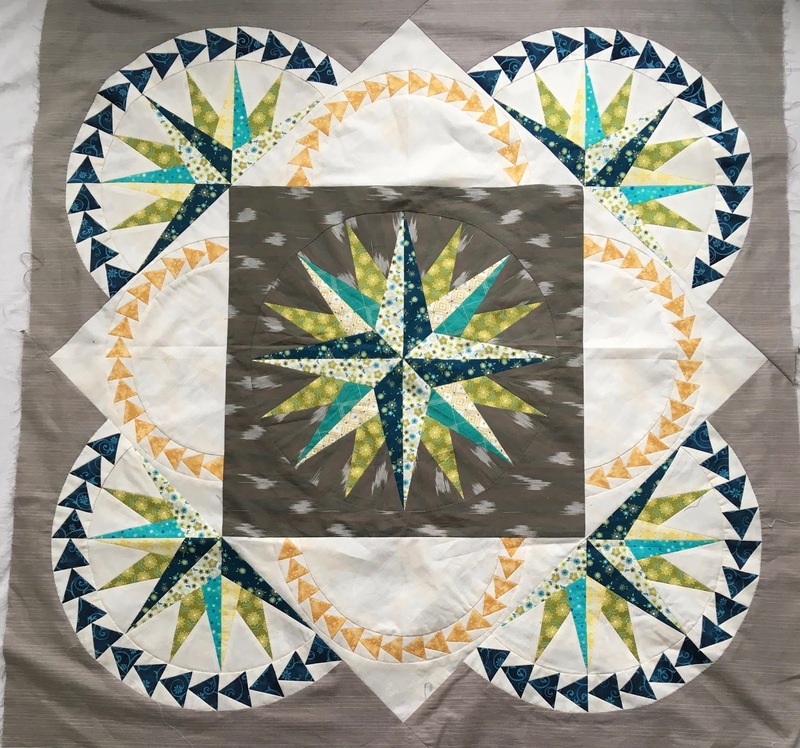 This is the latest finish - my East to West compasses. It has jumped the queue for quilting and will go onto the machine as soon as the customer quilt that is on there now is finished. I’m not quite sure how it will get quilted as of yet. I’m hoping inspiration will hit before I get there. 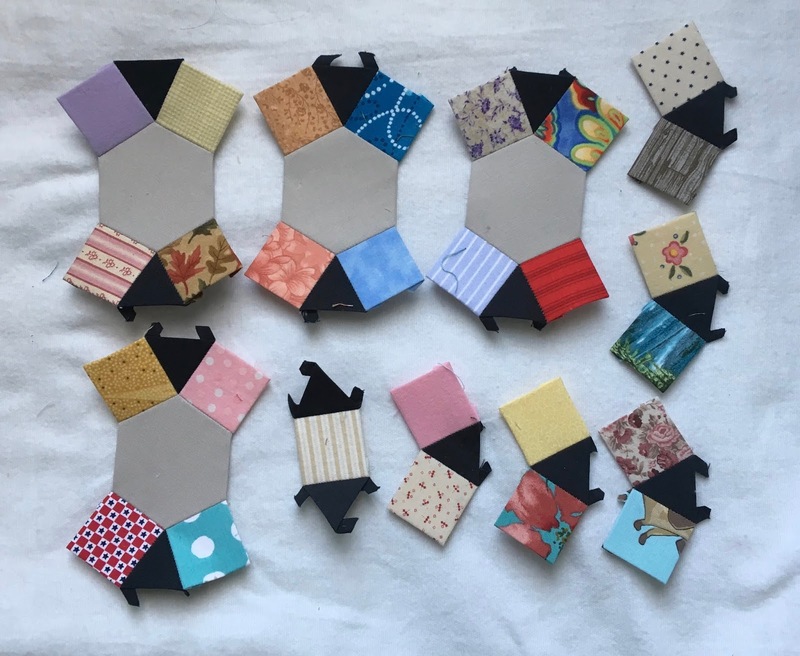 A group of us from the guild have decided to challenge ourselves to doing another Willyne Hammerstein quilt with the goal of finishing before the next quilt show. I’ve actually chosen two which are the new starts I mentioned. I’ve always wanted to do her quilt Good Times Bad Times out of her first book. It is made up entirely of 60 degree triangles in 3 different sizes. 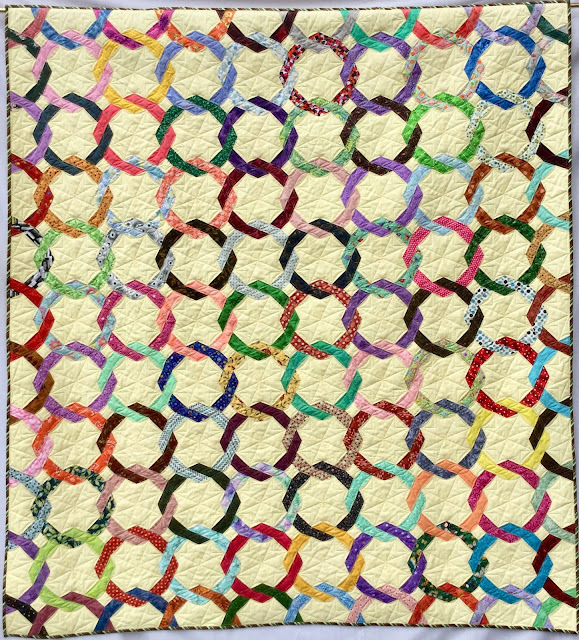 I’ve been wanting to get back into the Rainbow Scrap Challenge and this seemed a really good quilt to make that way. I’ve decided to take the colour of the month and pair it with its complement when making the blocks. This month’s colour was red, so I’ve paired it with a light green. I’ve figured out how many of the basic blocks I need and have divided that by 10 since that is usually the number of colours put out in the challenge. I need six of the small triangle blocks per colour and 4 of the large triangle blocks per colour. I’ve mixed up the placement of the main colour and the background colours to increase the visual variety. And then the other project I started is out of Willyne’s third book and is called Battle of the Stars. I did some fun fussy cutting with this first piece for it. I think this is going to be the centre star and the colours will be variations of what are in this. I’m linking up to Angela’s Rainbow Challenge today. And then on Sunday I’ll link up to Kathy’s Slow Sunday Stitching. 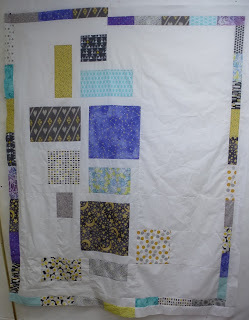 My goal for the end of last year was to get this quilt finished. One of my goals for this month is to get the pattern finished and released. I can now say that the writing is finished. It will go off to my editor next week to check for errors and clarity. I hope to have it released by the end of January. 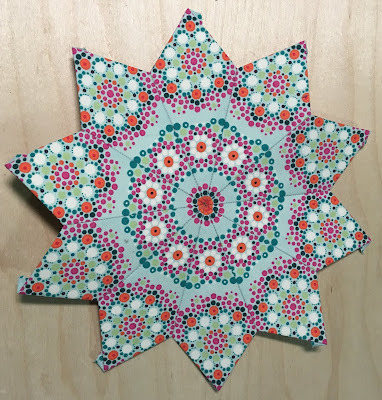 It is completely hand pieced using English Paper Piecing. Each of the chains is a different fabric, all of which came from my stash. I quilted it on my long arm machine. I used a diagonal print for the binding which picks up the fabric colours from inside the quilt and gives it a definite stop point on the edge of the quilt. I will announce here on the blog when the papers and pattern are available. I have had a couple of comments asking for notification from people who are no reply bloggers, which means I have no way to get in touch with them, other than here on the blog. I’m linking to Lorna’s Let’s Bee Social. 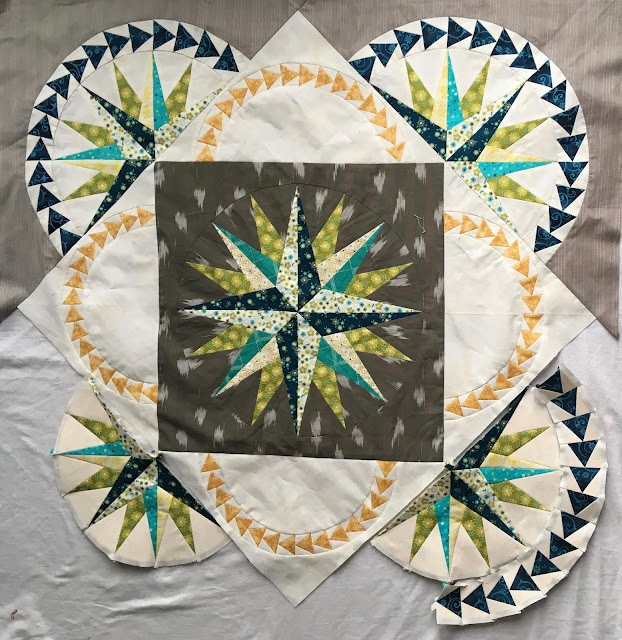 A few days ago I did a post about setting some goals for finishing off some quilt tops that have aged long enough on shelves in my studio. I think I want to do the same thing for some other areas as well. I have hand stitching projects that I’m working on or want to start that are also going to require some planning and goal setting. Once more, if I don’t write these thoughts down they will wonder off somewhere and get lost so I’ll write them down here. For this month I want to finish my East to West Compass quilt. 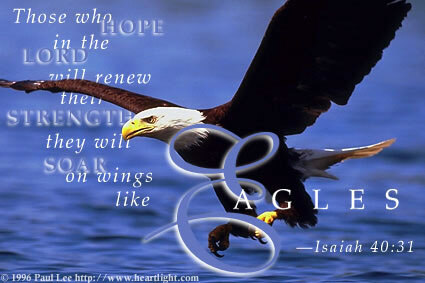 That has priority right now and is January’s One Monthly Goal. I have 3 more geese to sew onto the third triangle and then it can be sewn into the background. The other won’t take long. It should be done by this time next week. 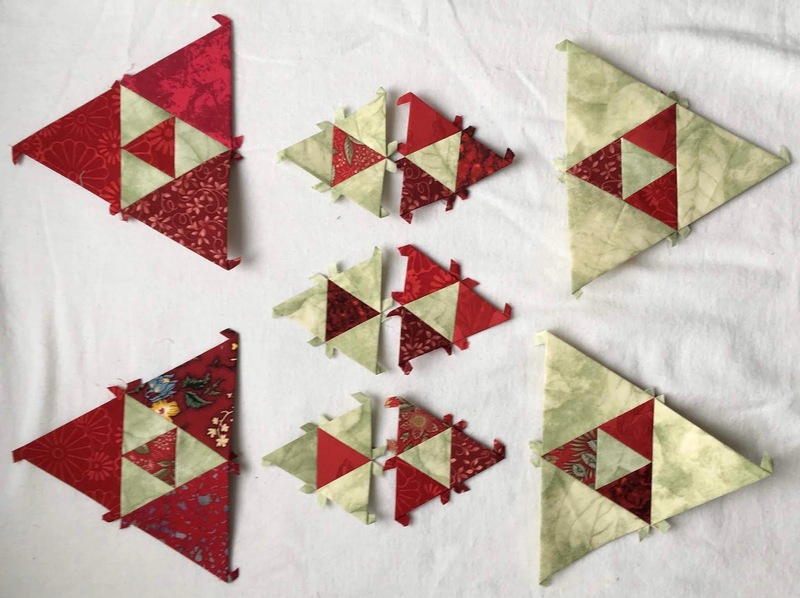 Then a group of us from the London Friendship Quilters Guild have decided to work together doing a quilt from one of Willyne Hammerstein’s 3 books. We’ve each chosen a different quilt to do. Our goal is to have them done before the next quilt show. I’ve chosen mine and actually picked out a few fabrics for it as well. I don’t have any pictures as yet. For that matter, the papers aren’t cut yet either. But I did that deliberately so that I wouldn’t be tempted to start it before finishing the Compasses. Another hand project I want to work on is called Connections. I put out a request earlier this year to guild members asking for 2 inch squares to use in the project. At the time I started it I was trying to decide between light grey or cream coloured hexagons and dark grey or tan coloured triangles. I settled on the greys. It got started and then set aside while I worked exclusively on Friendship Chain. I love hand stitching but it does have the down side of taking a long time to finish one project. This one doesn’t take long to make up the units. It’s the number of them needed that will take the time. Then I have one more that I started a couple of years ago that is a scrappy sampler type using large pieced hexagons that will be put together into something like a row quilt. I don’t have a picture of it. I went looking for the box that it is in but it seems to have gone missing for the moment. I’m sure it will turn up at some point, most likely when I’m looking for something else. It’s probably up in the studio since I usually take it with me when we are vending at quilt shows. 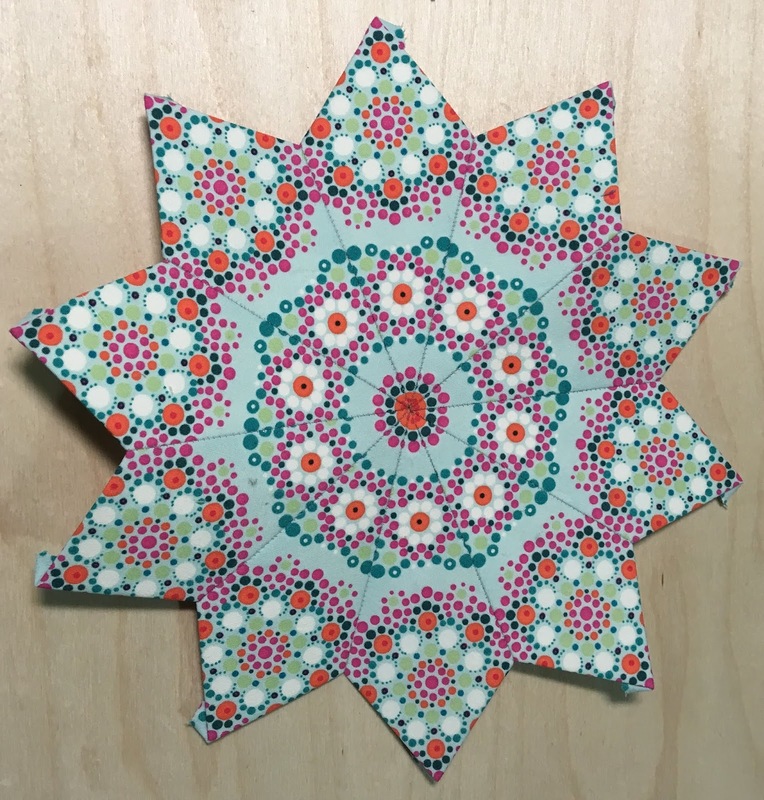 It’s a good project for demonstrating the technique. So that is 4 hand projects I want to work on, although it will be down to 3 very soon. What I’m trying to figure out is how to work on them all at once. Do I assign days to them....... no that won’t work, I think that would be way too confusing. Maybe I can assign weeks to them. Two weeks to the Willyne Hammerstein project, one week to Connections and one week to the sampler. That way each one of them would get some quality time each month. If I make a concerted effort to make sure each one of them has its own container and all the stuff for each one is kept together, it just might work. To keep myself on track with goals I’m going to join up with the One Monthly Goal linky party each month. At the beginning of the month I’ll write a goal post, which is what this one is although the rest will be shorter. And then at the end of the month write a post about what actually got done. Accountability helps and it also helps in motivation for blogging more often which is something else I want to do.